"Shallow water habitat is the food engine for the Columbia River system," Byers said. "We're just protecting our sensitive areas." Motorboats dragging thousands of feet of containment booms swept over the Columbia River Wednesday at Hat Rock State Park, working to contain an imaginary oil spill while incident commanders staged at the nearby McNary Yacht Club. David Byers, spill response section manager for the Washington State Department of Ecology, explained how in the event of an actual spill, the booms would prevent oil from washing into shallow water habitat along the shoreline, where small fish, insects and birds tend to congregate. "Shallow water habitat is the food engine for the Columbia River system," Byers said. "We're just protecting our sensitive areas." Though Wednesday's exercise was only a drill, Byers said it is incumbent on the agency and companies that transport crude oil to be prepared in the event of a potential disaster -- such as the fiery train derailment near Mosier along the Oregon side of the river. Byers was part of the unified command team at Mosier, which also included the Environmental Protection Agency, Oregon Department of Environmental Quality, Union Pacific Railroad, Yakama Nation and local fire departments. The single biggest lesson, Byers said, was the value of preparedness. "We had a lot of equipment staged and ready," he said. "We didn't spend any time fumbling around, wondering what was important to protect." That is why oil spill contingency plans are so critical to success, Byers said. As far back as 1990, the federal Oil Pollution Act has required oil companies to detail how they will respond to spills. Railroads, however, were not included under the law. In April 2015, Washington Gov. Jay Inslee signed the Oil Transportation Safety Act, which extended contingency planning and drill requirements to railroads as oil-by-rail increased statewide. According to Byers, Burlington Northern Santa Fe Railway now moves 10-15 oil trains per week down the Columbia River, with each train carrying roughly 3.5 million gallons of crude oil. BNSF is one of four companies transporting crude oil in Washington, and the first to have a contingency plan approved by the State Department of Ecology. The plan was put to the test Wednesday, along with an updated contingency plan for the oil company Andeavor, formerly Tesoro. Andeavor operates an underground petroleum pipeline that crosses the Umatilla Indian Reservation en route to the Tri-Cities. Byers said the group chose Hat Rock to practice oil spill response because it could feasibly experience an oil spill by rail or pipeline. "We're making sure everybody has the appropriate training," Byers said. "There's a lot of moving pieces that have to come together in an oil spill, and work appropriately." Breezy winds made for slightly choppy waters Wednesday on the river, but nothing the crews couldn't handle. Andeavor also deployed a new piece of equipment known as a Current Buster, capable of recovering oil four times faster than conventional booms. Byers said Washington law requires companies with oil contingency plans to use the best available technology. Resources are shared across state lines with Oregon when it comes to the Columbia River, he added. "We have a great partnership with Oregon," Byers said. "We view the Columbia River as a shared resource. 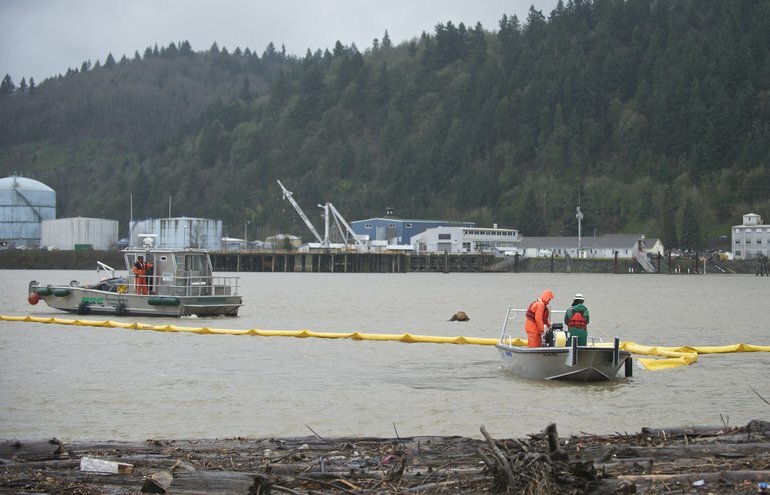 If there is an oil spill, it's going to affect both states." Byers said the drills also allow states to test their Geographic Response Plan for the Mid-Columbia River, which was updated in 2015. That plan provides site-specific strategies for cleanup response, such as staging areas and resources that may be threatened by a spill. Geographic Response Plans fall under the Northwest Area Contingency Plan, which covers all of Oregon, Washington and Idaho. "It takes the combined resources of the entire response community," Byers said. While emergency planning is undoubtedly a valuable tool, environmental groups in the Columbia River Gorge remain dubious of oil-by-rail and continue to warn of the dangers of train derailments and spills. Dan Serres, conservation director for Columbia Riverkeeper, said there are still holes on both sides of the river where responding to an incident would be difficult. Despite planning and preparation, he said the Mosier derailment still resulted in a 14-hour fire, and water contamination that posed significant safety concerns for the community. If a controversial new oil terminal in Vancouver, Washington is approved, Serres said it would add another five oil trains traveling daily along the Gorge, increasing the risk for another calamity. "It would be a game-changing proposal, and not in a good way," Serres said. "Our basic concern about oil-by-rail remains."